You are here: Home > The Editor's Blog > What have Walkers are Welcome been up to? What have Walkers are Welcome been up to? Last Winter Bingley was affected by one of its worst natural disasters when the River Aire burst its banks and reached a record 3.02m height on 27th December. Many lives and businesses were badly hit but thanks to the community spirit many people came together to give a hand. We also saw a lot of damage to our walking paths and quite a few bridges either became unsafe to walk on or simply got washed away. At that point many of us thought it would take forever for any of this to be repaired. But no, our scepticism was unfounded and thanks to the great work from the Countryside & Rights of Way Service many of our paths and bridges were back to their former selves in no time. For example, it was a great pleasure to be among the first people to use the newly rebuilt footbridge on Cottingley Beck during our February monthly Sunday walk which was led by David Smith. Talking of which, our regular monthly Sunday walk has been going on for a full year without interruption! Rain or shine we have always had enough participants to go ahead with the walk. 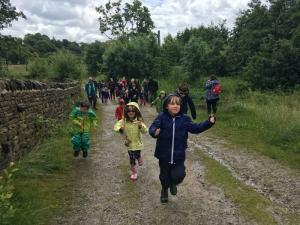 Despite the unforeseen weather circumstances, our small committee was determined to make Bingley a great walking place and earlier in the year a project to create a long distance walk was well underway. Talks had already been going on for many months between Burley in Wharfedale, Otley and Baildon to create a 28-mile circular walk between the three towns which are like us part of the Walkers are Welcome towns network. Because Bingley is literally only a few steps away from Baildon, we had approached them to be part of the project and it was agreed that we would create a Bingley Loop off what was to become The Welcome Way. So two of our walk leaders, David and Ronda, got together and started to work on creating this brand new walk. 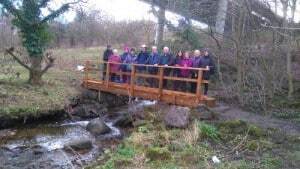 By early February, an outline of the walk was ready and on a cold and wet Saturday morning a group of 5 people trialled it for the first time. A few corrections later and the itinerary was finalised and thanks to the help from some generous sponsors the leaflets were finally off the printing press by end of May! We then installed the waymarkers just on time for an official pre-launch of the Welcome Way during the Third Baildon Annual Walking weekend on 11th June. The official launch of this new long distance path was done as part of the Otley Walking Festival on 25th June which we of course attended. Kate Ashbrook, patron of Walkers are Welcome, General Secretary of the Open Spaces Society and Vice President of the Ramblers also attended and wrote a great post about the day on her personal blog. Get your copy of The Welcome Way Bingley Loop in one of the local shops! So far this year, we’ve attended quite a few events to rise awareness of our organisation among the local community. We also organised our first AGM back in April where an estimated 30 members of the general public attended. 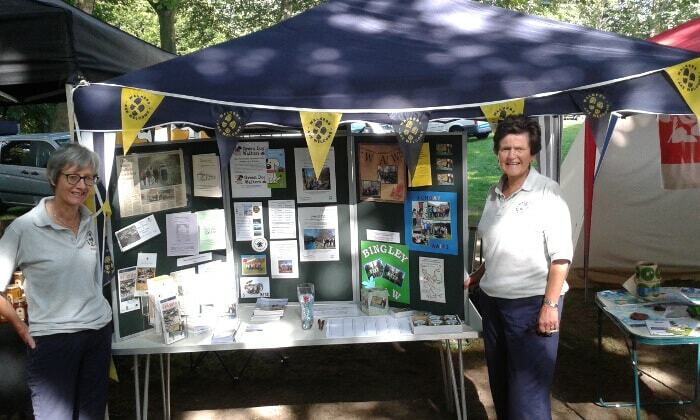 The Welcome Way kept us busy and we had a stall at both the Baildon Walking Weekend and the Otley Walking Festival. 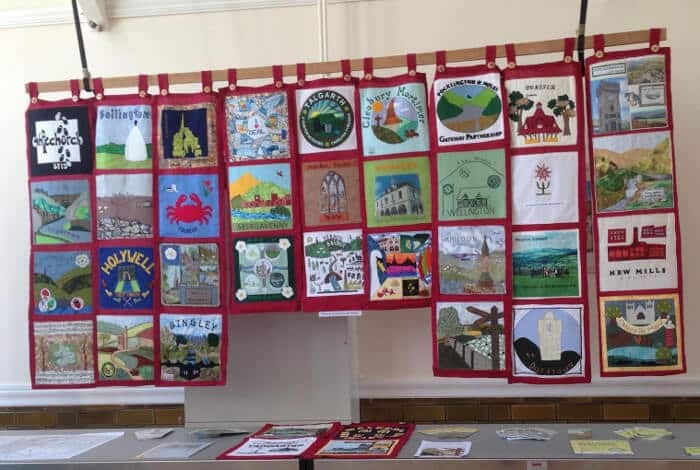 One of the most interesting features at both events was the display of the Walkers are Welcome national wall hanging which is made up of embroidered squares representing many of the member towns. 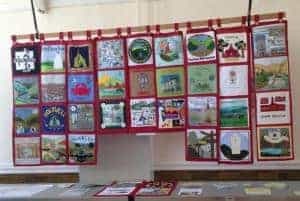 Ours was created by Doreen Thompson who is a member of Bingley WI and is now proudly displayed with the other towns – you can find a close up of the Bingley square on this page. Another event we also attended was the first “Brilliant Bingley Biathlon” day in early July where we had a stall in Myrtle Park. This was a great occasion to meet up with the local community and visitors to the town. We also wanted to show our support to other local organisations which like us want to raise Bingley’s profile. We all felt very positive about the day and felt it was very worthwhile. It will be interesting to see if any of the people who enquired about our walks will join us on a Sunday walk in the future. A big thank you to everyone who helped man our WaW stands at all the shows and events cited above as well as all the walkers who regularly go on our Sunday walks. We hope you enjoyed the WaW experience and will join us again in the future. Please leave us a comment below if you have any feedback. I'm a Frenchman living in this beautiful town of Bingley in West Yorkshire. I love the great outdoors, walking and also write a blog about Yorkshire - have a gander: Walk in Yorkshire. I'm also the webmaster for this site.